The Economic Freedom Fighters (EFF) and the Congress of Traditional Leaders of South Africa (Contralesa) say they’re in agreement that Section 25 of the Constitution, which deals with right of property ownership, should be amended. This as Parliament’s Constitutional Review Committee is holding countrywide public hearings into whether the Section should be amended. However, King of Amazulu Goodwill Zwelithini has said government should back off from the land issue. The King strongly warned those suggesting that he lose his land and vowed to take the Ingonyama Trust issue to the Constitutional Court if the need arises. 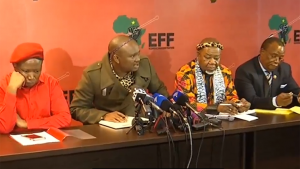 During a joint media briefing in Braamfontein, Johannesburg, the EFF and Contralesa emphasised their view that the State should be the custodian of expropriated land. The post EFF, Contralesa push for Section 25 amendment appeared first on SABC News – Breaking news, special reports, world, business, sport coverage of all South African current events. Africa's news leader..